It’s May and it’s Soup Day in Spain!! It is raining and the temperature is down at 13,5 degrees (C). It is that week of the year where our family and friends in Denmark like to point out that it is warmer there than here!! But what can I do; stay inside, read a good book and enjoy a well-made soup. Peel and cut all the vegetables. Then grate the lemon and squeeze the juice. Whip the sugar and softened butter well in a bowl, add the eggs one by one until the mass is white and fluffy. Combine the flour, baking powder and vanilla sugar. Then add it bit by bit to the sugar mass, while you stir it gently. 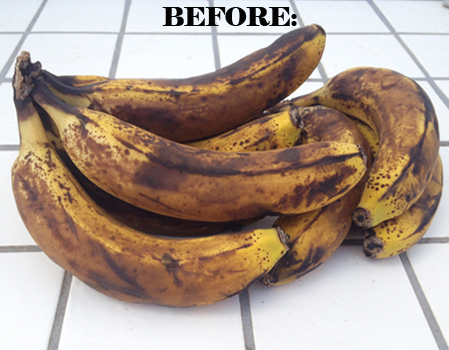 Mash the banana(s) well and add it to the rest. When everything is mixed, pour it into a greased baking tin. Bake in oven for appr. 55 minutes at 175 degrees C (350 degrees F). – are really easy to make and delicious to eat!! Heat up a frying pan, add the almonds and soy sauce. 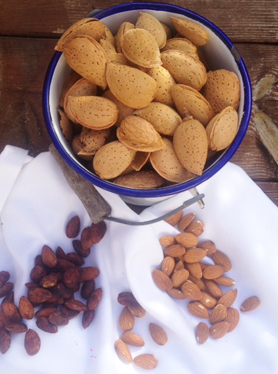 Stir until the liquid has evaporated, take the almonds off the pan and let them cool off. 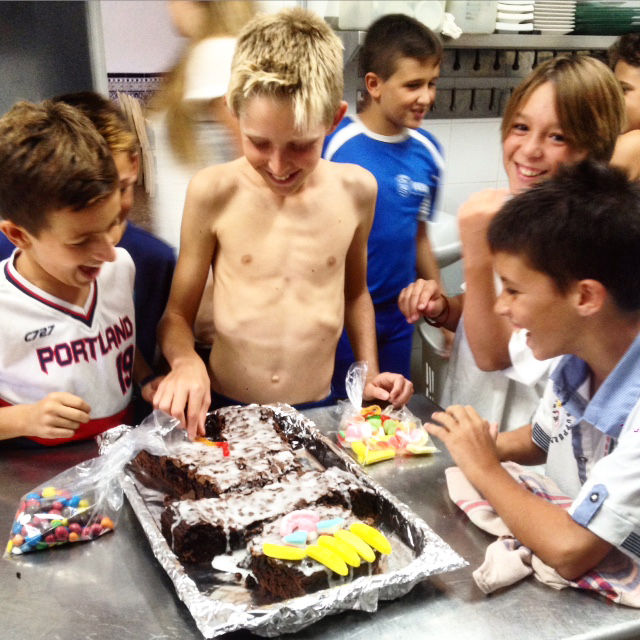 Last week we celebrated David’s birthday and in our family we have a cake tradition, which we brought with us to Spain, to big amusement for our kids’ friends. This cake was very typical in our Danish childhood, where our mums made it. At a child’s birthday party there would always be a “cake man” or “cake woman”. Thursday morning, when David was in school, I baked a big chocolate cake. 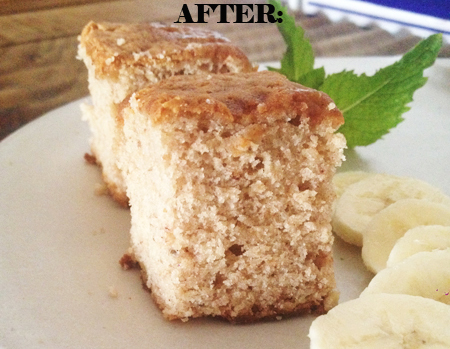 It doesn’t have to be this exact recipe, but it is super easy and the kids love it! 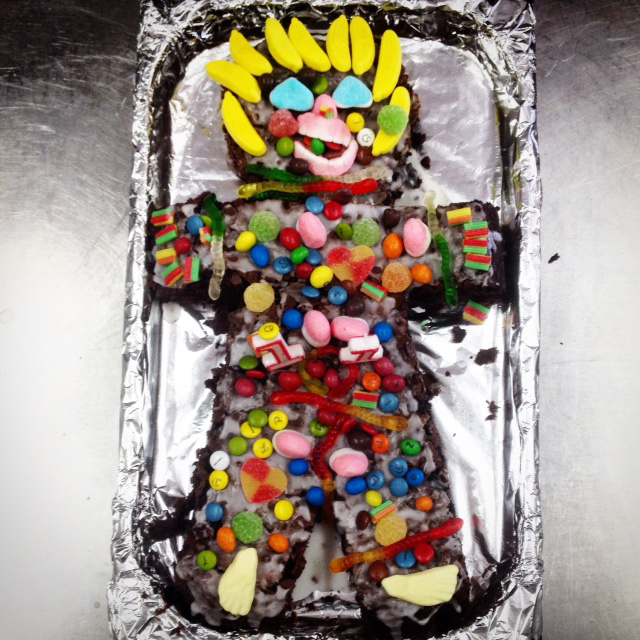 (You can find the recipe on the bottom of the page) When it had cooled of, I cut it in the shape of a boy. Obviously at Thea’s parties, the cake is shaped with a dress instead of trousers. The first kids arriving help decorating the cake with candy. While I spread the icing on top of the cake, they are ordered to wash their hands, and then we are ready. They always have lots of fun doing it; two blue-coloured sweets for eyes, yellow for hair etc. to make it look like the birthday child. Remember(!!!) to buy plenty of candy, because half of it goes on the cake and the other half in their mouths. In a large bowl whip the sugar and softened butter well, add the eggs one by one until the mass is white and fluffy. Combine the flour, baking powder, vanilla sugar and cocoa and then add it bit by bit to the sugar mass, while you stir it gently and adding milk. When the batter is smooth, add the boiling water and again stir until smooth; the batter will be thin. Pour the batter into a pan prepared with baking paper. Bake in the preheated oven for 45 to 55 minutes, or until a toothpick inserted into the center of the cake comes out clean. Allow to cool before you cut the shape of a boy/girl. Here is a great suggestion for a nice summer Salad. Blend the avocado, yoghurt, lime juice and zest, grated garlic clove, water, sesame oil and olive oil in a blender until smooth, and season with salt and pepper. Divide the cold soup into 4 deep plates. Mix the lettuce leaves together, having rinsed and patted them dry. Deshell and devein the lobsters without removing the heads. Fry in oil with 2 unpeeled garlic cloves. Halve the tomatoes, finely slice the spring onion and slice the limes into boats. 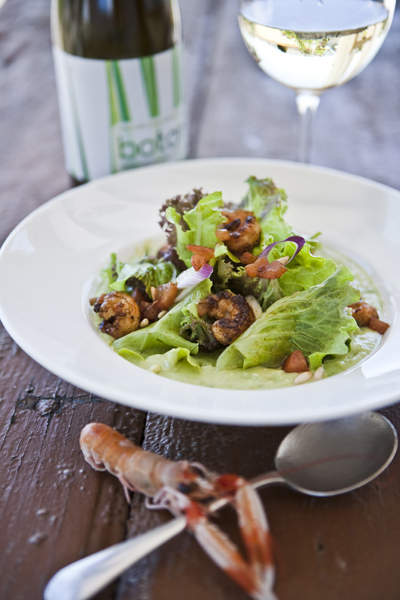 Spread the tomatoes, spring onion, lime, pine kernels and prawns over the soup and lettuces. Drizzle with virgin olive oil and sprinkle torn coriander on top. This ideal summer dish also tastes great with king prawns or scallops. Bring milk, cream, sugar and vanilla to the boiling point. Whisk lightly together, in a bowl, the egg yolks and maizena. Slowly pour the cream/milk into the egg yolks, while whisking. When well mixed pour everything up in the pot again. Put it on low heat and whisk until it becomes thick (1-2 minutes…), then take it off the heat and sieve it and refrigerate it until you need it. This is called English cream! Clean in cold water the strawberries, nip the green top off and cut each in 4 or 6 pieces. Grate the zest of 1 lime and juice both of them, put juice and zest in a small pot with the sugar, water, vanilla and chili. Bring it to the boil and let it cool off in the pot. Sieve it and marinate the strawberries for a few minutes in it. Just before serving mix in the chopped mint leafs and toasted pistachio nuts. Pour the English cream about halfway up, in 4 glasses. 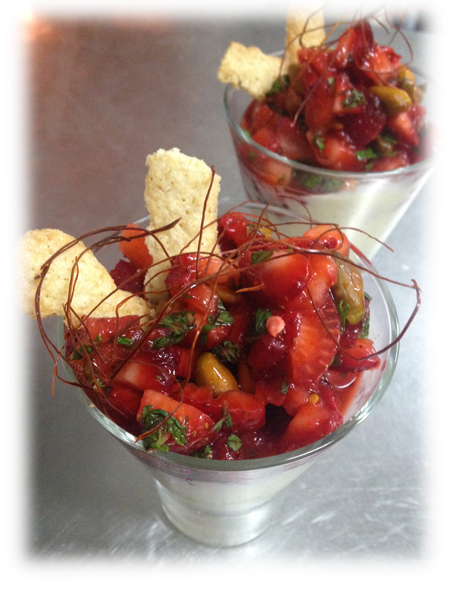 The other half you fill with the strawberry ceviche. Serve them with a crusty cracker and maybe some shredded, freeze dried chili as in the photo. When the strawberry season is over, you can replace them with watermelon, peaches etc. (or with the seasonal fruits and berries in your part of the world) as will we in the restaurant.